By welcoming young people into your work, you are helping us grow compassionate communities. Year after year, we hear from students that the visit to their charity was the moment their learning became meaningful. When they have the opportunity to see firsthand the demand for social services, and the effort of a committed professionals it is, in their own words, “eye-opening”. On this page, we’ve put together information and resources to help you navigate the YPI process, and to get the most out of your time working with student teams. If you ever need more support, we’re here to help! 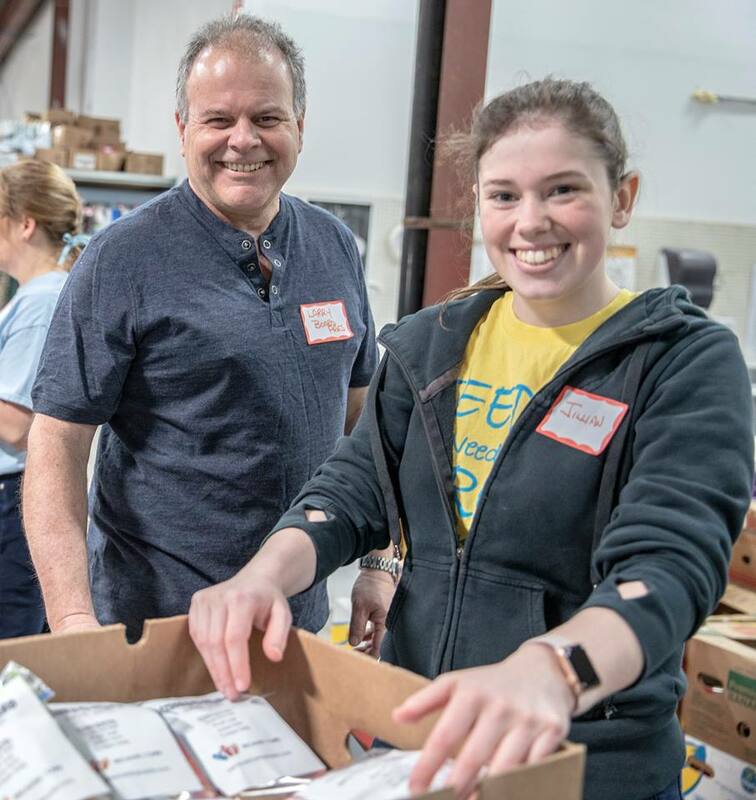 A student turned volunteer at Feed the Need in Durham, Ontario. We can’t say enough about how amazing YPI is in helping to foster our future leaders in understanding the importance of giving back. YPI is a simple premise with extraordinary results. With every grant awarded through our school-based competition, YPI channels financial resources, public awareness, and volunteers to local social service charities. Since 2002, YPI and our partners have granted millions to charities on behalf of these passionate young people. Together they have challenged stigma, changed behaviours, and introduced millions of Canadians to the work of thousands of charities. Check out a selection of the organizations our students have worked with in the past. Every YPI team tells an average of 50 people about their chosen charity and the social issue it addresses. Working with student teams can be an opportunity to raise awareness, recruit volunteers, and generate local support for your work! 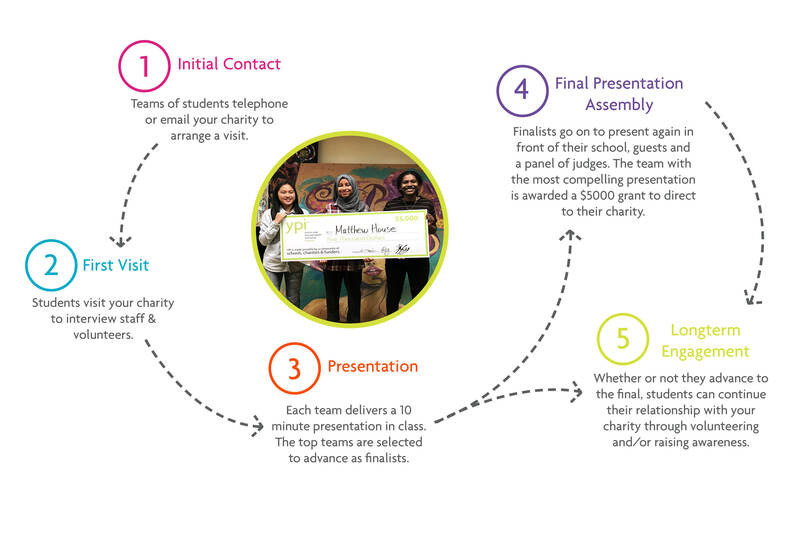 This diagram shows how YPI's process works for charities. Below, we’ve collected the answers to some of the most common questions about working with student teams. What is YPI and why are students choosing our charity to contact? For a social service charity, YPI provides an opportunity to engage young people from within the same community in which you operate so they can become informed advocates for the work that you do. The students who have contacted you are participating in a project-based competition as part of their school curriculum, and they have identified your charity as carrying out important work that benefits people living in your shared community. These students are eager to visit your charity, learn more about you, and then advocate for the work you do in hope of securing your organization a $5000 YPI grant! Why does YPI want students to visit our charity? YPI is powerful for students because it connects them to real issues affecting their communities, and the charity visit is a key part of this. It can deeply personalize the social issues for students, opening students’ eyes and minds to the needs of vulnerable people living around them and the vital work being done to help. These visits have the potential to forge a powerful connection that will often drive students to be strong advocates and to explore their own roles and responsibilities in bringing about positive social change. What sort of information will students be asking? In their presentations, students are expected to describe how a social issue impacts their local community, and how your organization helps community members experiencing those challenges. They will want to learn more about the programs and services you offer, some of the outcomes you create for your clients, the long term impacts of your work on the social issue, and what resources it takes to make all this happen. They’re also asked to describe what attitudes, behaviours or actions the audience could change that could help your organization or the people you serve. Share as much information as you can, but don’t be afraid to redirect students’ efforts when appropriate—they should already have learned what they can about your organization online, and you can direct them to these sections of your website when you confirm their appointment time. Interviews and visits are intended to be a forum for deeper questions about your approach and the challenges you face. How can we best prepare for a student team visit to make it worthwhile? Many participating charities take students for a short tour of their location, and then sit down to allow them to interview. If you have programming that they could see first-hand, or opportunities for them to participate as volunteers, this hands-on element can be extremely effective. Where this is not possible, try to engage students with real stories of how people have been helped by the work that you do. Create opportunities for them to speak with other staff about their work. Volunteers can be great spokespeople, too; what about your organization inspires them to give their time? Talk to them about upcoming events, new initiatives or specific challenges your organization is working on that you would particularly like the community to be aware of. There can be a lot of information to absorb! Print materials you can send them home with, like annual reports, brochures and program calendars, will be a great reference when they are creating their presentations. It’s important to communicate any boundaries that may exist with your organization. For example, if your building is scent-free, or if taking photos, video or audio recordings would be disruptive to confidentiality, let them know ahead of time (if available, direct them to media they would be permitted to use). What happens after the students visit us? Students will develop a presentation to be delivered in their classroom advocating on behalf of your charity. The top presentations from within the participating grade will go on to a YPI Final Event at their school, where one group will secure a $5000 grant for their chosen charity. If their chosen charity is selected as the recipient of a YPI grant, students will most often notify the charity by phone immediately following their school’s YPI final, or shortly thereafter. We always prefer YPI students to be the bearers of this good news, but if they are unable, your charity will be notified by a YPI Canada representative. Outside of their YPI experience, students may choose to stay involved with your charity, whether as volunteers, youth advisors, fundraisers, or in other capacities. How can my charity get the most out of working with YPI students? Young people often have a lot of social media experience; if appropriate, they may be able to help build your organization’s online profile, or offer creative ways for engaging your audience more effectively. We’ve seen some great videos produced by YPI students, showcasing the work their chosen charities do. See if your student group would be willing to create a video for your charity to share online. In many cases, students continue to volunteer with their chosen charities after YPI. Ask your group if they’d be interested, especially if you have any upcoming events where they could be helpful. What if I have more questions, or an issue comes up while working with students? We are here to support you in having a valuable and positive experience with YPI. We’re happy to guide new organizations through their first visits, hear feedback from you, and work on challenges as they come up. Give us a call at 1-888-489-1044 or send us an e-mail at info@goypi.org. Connect with YPI on social media, where we engage with students, teachers and other charities from communities across Canada. We absolutely love seeing how students are getting involved in your work, so please tag us in any posts you share! Whether it’s photos, stories, or quotes from student visits, sharing your YPI experience with our audience can help raise continued awareness for your cause.